Whether you're laughing involuntarily at a joke, or smiling politely at a stranger's unfunny anecdote, your facial expressions play an important role in communicating with those around you. Now, an investigation into the playtime behavior of gorillas reveals that they use facial expressions akin to our smiles and grins to reassure friends of their non-violent intentions. The results, researchers say, could help point to the origins of human guffaws. Researchers have long believed that gorillas, like humans, use facial cues to communicate information. Researcher Bridget Waller — an evolutionary psychologist at the University of Portsmouth — studies facial expressions in primates to uncover the evolutionary origins of human smiling and laughter. "Through facial signals," writes Waller — along with coauthor Lyndsay Cherry — in an article published in the latest issue of The American Journal of Primatology, "individuals can potentially send and receive information and may benefit from coordinating their behavior accordingly." Different social situations call for different facial expressions. If a stranger offers you his or her seat on the subway, for example, the appropriate response is usually not to laugh at them, but to smile politely. 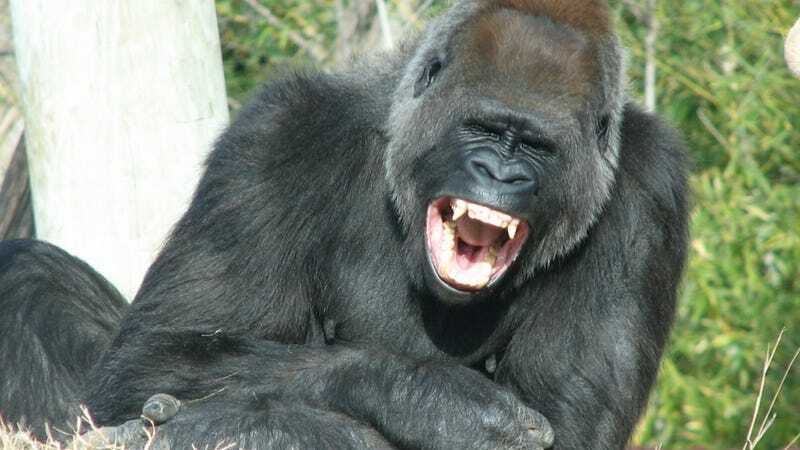 Two commonly encountered gorilla facial signals are the "bared-teeth" signal — wherein the mouth is open and both rows of teeth are clearly visible — and the "play face" — where a gorilla opens its mouth, but does not bare its teeth whatsoever. The play face, as its name implies, is used during play behavior. According to Waller, it is a foundation of human laughter. "[During play, gorillas] open their mouths and cover their teeth as if to say, 'I could bite you but I'm not going to,'" explained Waller in an interview with the BBC. The bared teeth signal, on the other hand, "is a signal of appeasement, submission and/or affiliation," and is thought to be related to the origins of human smiling; in other words, if you gave a gorilla your seat on the subway, it would be more inclined to bare its teeth at you than flash you an open-mouthed play face. But in Africa's western lowland gorilla, a third facial expression is often observed — a mix of the play face and bared-teeth face. The result is a grin wherein only the top teeth are bared. When Waller observed the playtime behavior of ten different western lowland gorillas, she found that those who wore this third expression — called a "full" play face — tended to do so during especially intense bouts of play; and when the gorillas were observed making the face, their play sessions tended to carry on longer than those that featured the toothless play face. In other words, Woller's findings suggest that the full play face is used specifically to coordinate and maintain play — an effect that she hypothesizes is achieved by reducing uncertainty in the receiver, and reassuring that a particularly rowdy play session is, in fact, play.